Click here for newsletter version! 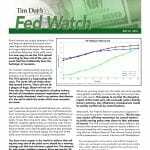 Bond markets are caught between a Federal Reserve determined to push short rates higher while demand stays strong for longer dated safe assets. The result is a relentless flattening of the yield curve. It is now easy to see the 10-2 spread inverting by then end of the year, an event that has traditionally been the harbinger of recession. An inversion would certainly raise my attention with regards to the possibility of recession, but be careful on the timing. 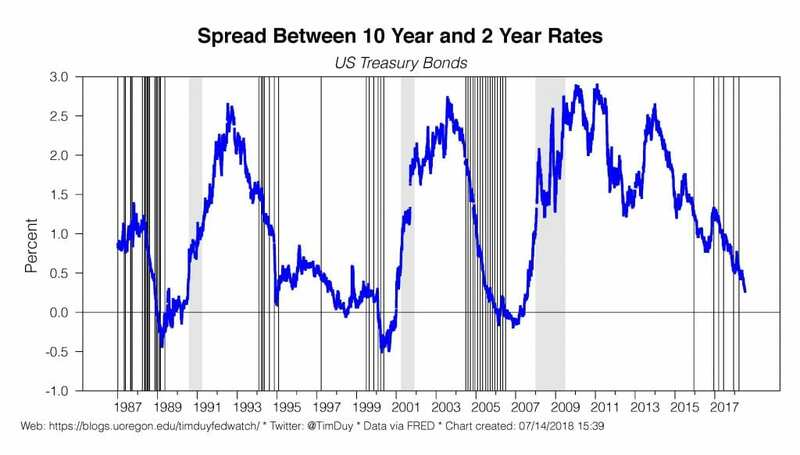 The 10-2 spread is a long leading indicator. The earth will not shake when that spread inverts. There will not be a plague of frogs. Blood will not rain from the sky. 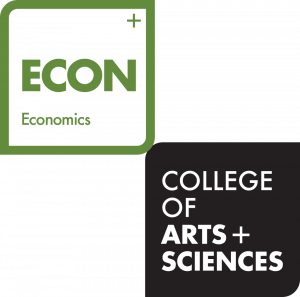 From the perspective of policy makers, the lack of immediate economic implication means it can be easily dismissed. And in my opinion that dismissal is the soil in which the seeds of the next recession are sown. Last week the interest rate spread between ten- and two-year Treasuries narrowed to a cycle low of 25 basis points. Such narrowing is a typical characteristic of a tightening cycle as short-term rates respond more quickly to monetary policy moves than long-term rates. This cycle has been no different. 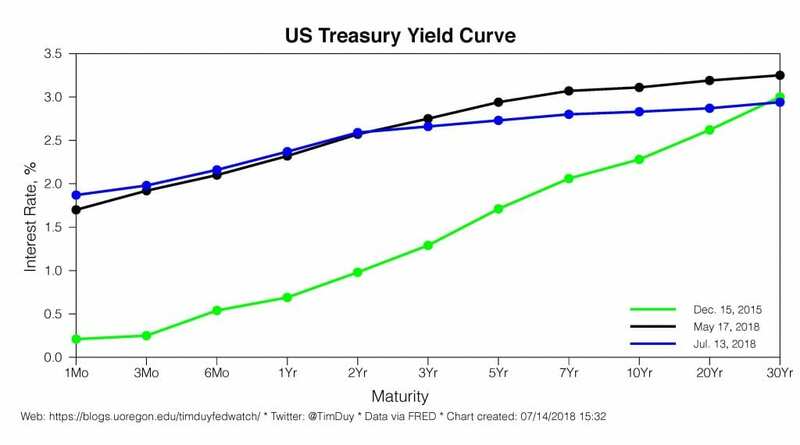 Despite tighter policy, an economy near full employment, quantitative tightening as the Fed reduces the balance sheet, and a fiscal budget situation that promises to deliver massive new bond supply, the long end of the yield curve remains locked to roughly three percent. You have every reason in the world to believe that selling the long end of the yield curve should be a winning strategy yet that has not been a good bet. The demand for safe assets yielding a meager three percent for 30 years is apparently unquenchable. Moreover, growing angst over the trade wars (and arguably rising global instability on all levels) only drives more interest in safe assets. 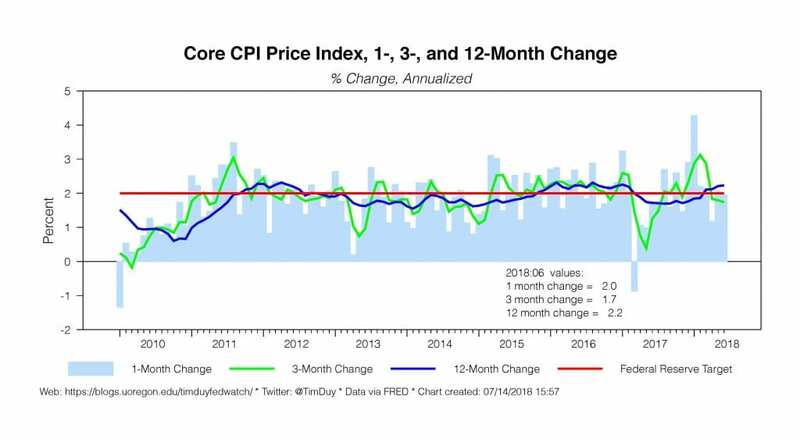 This signals to me that the disruptive impact of the trade wars will eventually yield a disinflationary outcome. Any inflationary consequences would be quickly snuffed out by central bankers. As unemployment came down and inflation began to move up, we began very gradually increasing our policy rate, which affects rates throughout the economy and tightens financial conditions. So we’re returning rates to a more normal level. If we leave rates too low for too long, then we can have too high inflation or we can have asset bubbles or housing bubbles. If we move too quickly, then we can unintentionally put the economy into a recession or cut off the return of inflation at 2 percent. So we’re always balancing those two things. I think for many yeåars there was nothing to balance, we had to keep rates low. I think as the economy’s gotten healthy, now we’re into balancing those two things we’ve got to steer between. 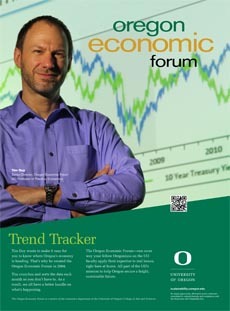 This view underpins the Federal Reserve’s strategy of gradually raising interest rates. And the data flow provides no reason for them to change that strategy just yet. While rebounding, inflation still remains sufficiently contained to preclude a faster pace of rate hikes. 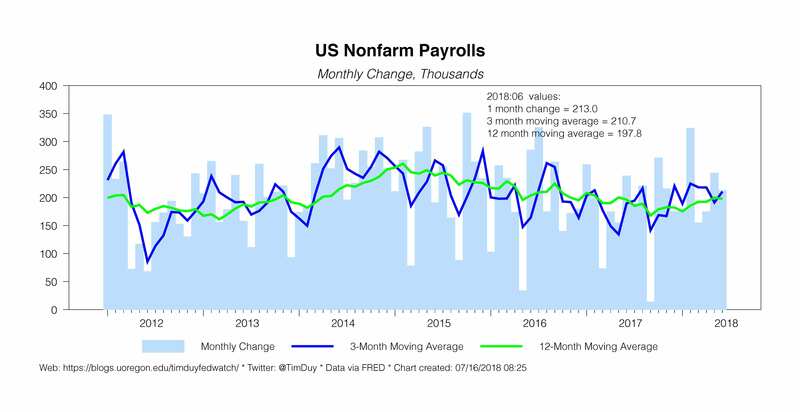 At the same time, fears of trade wars are not yet sufficient to justify pausing rate hikes in an economy that still generates 200k new jobs a month. Overall, given the Fed’s policy direction, the strong underlying demand for safe assets, and the potential and increasingly likely disruptive impacts of a trade war, I find it difficult to expect anything other than continued flattening of the yield curve. 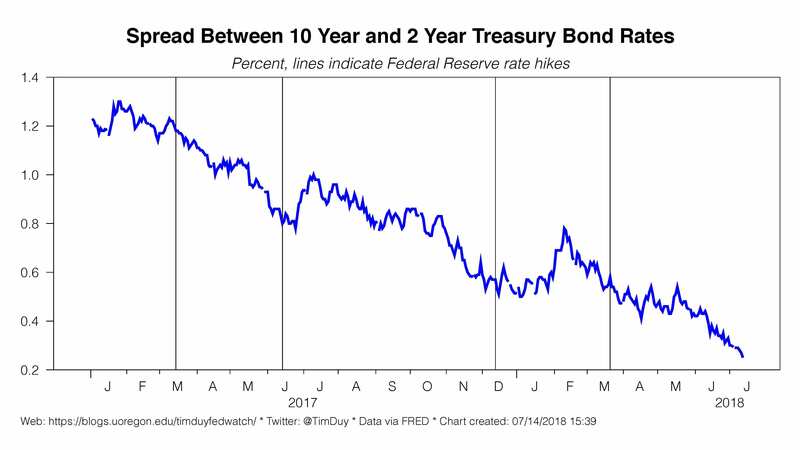 Commonly cited measures of the term spread, such as the difference between the 10-year and 2-year nominal Treasury yields, have dropped over the past several years (Figure 1, blue line), a trend that has raised concerns and provoked extensive commentary in the financial press. Those concerns owe to the statistical power that low levels of term spreads have shown for predicting historical recessions over the subsequent year or so. No, low levels of the term spread do not predict recessions. Only inverted curves predict recession. Once you recognize this misunderstanding, you can see why the authors’ approach of using a probit model to assess recession probabilities is problematic. A low term spread is very difficult to distinguish from a small inversion, and since there are many, many outcomes of a low level of term spreads that do not predict recession, the recession signal in such a model from even an inverted yield curve is fairly weak. Moreover, the authors only test predictive power up to four quarters out. This is unfortunately too strict as the signal could be as much as two years early. In any event, this research adds to the list of reasons why the Federal Reserve is inclined to ignore any recession signal that comes from an inverted yield curve. The primary reason is that the inversion occurs well before an expansion ends, a time when the data flow tends to look about as good as might be expected (see today’s retail sales report) and when it appears inflationary pressures are building. Secondary reasons are the low term premium (which again has remained low despite quantitative tightening and fiscal stimulus), the belief that the level of rates is the important factor, and of course everyone knows that the Fed has never caused a recession at such a low level of rates. Now all of these reasons might be correct and the Fed should ignore the yield curve. Fair enough. This time might in fact be different. That said, until proven differently, I continue to think that an inverted curve signals that monetary policy is either just right or too tight relative to that consistent with continued growth. This is irrespective of the level of rates. So maybe a slightly inverted 2-10 spread is just right. Hence an inversion does not need to signal a recession, correct? Yes, I would agree with that. I think the odds of recession should rise if the Fed continues to hike rates after the 10-2 spread inverts. Indeed, the Fed tends to continue hiking after the 10-2 spread inverts. This was not the case, however, in 1998, when the inversion was greeted by the Fed with a rate cut. I fully expect the Fed will continue hiking rates if the yield curve inverts unless there is a clear financial meltdown at that time. 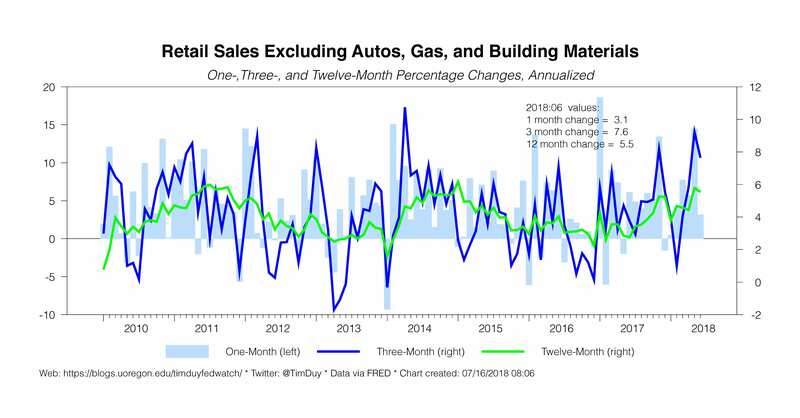 For the reasons above, Powell & Co. will find it impossible to resist the siren song of the data near the peak of a business cycle. When the hikes continue after the yield curve inverts is when I go on recession watch. But again, timing is everything. Because the inverted yield curve is a long leading indicator, equities easily might continue to rise in the period after the inversion but before the recession. Hence, the inversion would likely be a premature “sell equities” signal. Bottom Line: The U.S. economy retains substantial momentum, easily sufficient for Powell & Co. to stick with their gradual plan of gradual rate hikes. That plan has to date flattened the yield curve just like in every tightening cycle as long rates have held stuck near three percent despite every reason to think they will move higher. I don’t expect this situation to change, and hence expect that on the curve will continue to flatten as long as the Fed continues to hike rates. An inversion is likely at some point in the foreseeable future. The Fed is likely to continue hiking after that inversion – and that is the point at which I would look for storm clouds on the economic horizon.